The following activities and methodology were used in first quarter of the project. Main Proceedings:The proceeding started with the introduction and opening remarks by Mumtaz Mughal, Resident Director at head office of Aurat Foundation in Lahore. Detailed sessions were held on airing of GEP documentary, quick review of universities’ LOGs, reporting requirements, monitoring mechanism, branding and marking requirements, financial reports, compliance and GST requirement. 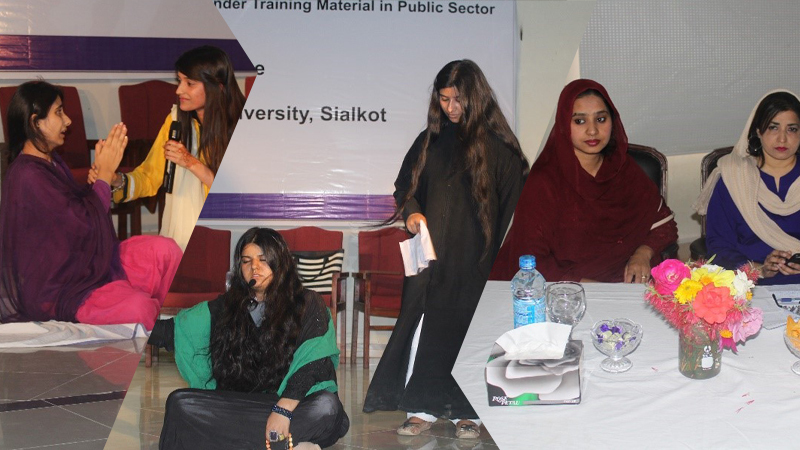 These sessions were conducted by Hasna Cheema, Rizwana Waseem , Azmat Deol and Asim Paracha. The “Grant Opening meeting” was ended in with vote of thanks. Main Proceedings:The proceeding started with the recitation of versus of Holy Quran followed by National Anthem. Formal proceeding started with introduction and opening remarks given by Prof. Naila Arshad, Chairperson English Department / Program Coordinator Aurat Foundation/USAID Grant. She has given the detailed briefing of project background, project description, and activities to be completed during project time period. 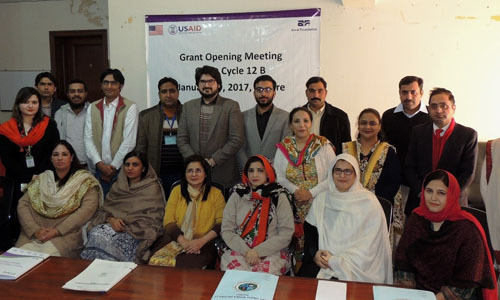 Ms. Hasna Cheema, Deputy Program Manager, Aurat Foundation Lahore has given the introduction of Aurat Foundation and USAID. 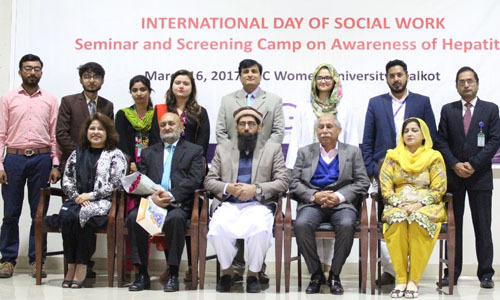 Dr. Asif Tufail, Deputy Commissioner District Sialkot was the Chief Guest at this occasion. He briefly talked about the importance of women in our life. Prof. Dr. Farhat Saleemi, the proud Vice Chancellor of GCWUS ended the ceremony with vote of thanks to Aurat Foundation/USAID. She also appreciated the efforts made by Aurat Foundation regarding the Gender Equity Program. Purpose: The National Women’s Day was celebrated to create the awareness among the students and faculty members. This session was conducted in the auditorium of GC Women University. 15 students were participated and delivered the speeches on the topic given above. 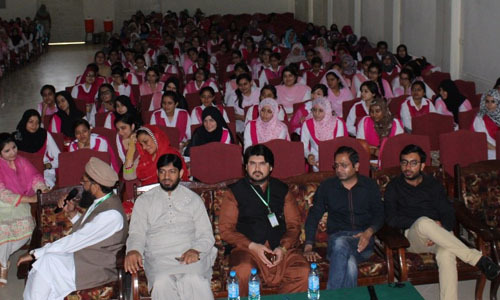 3 judges were selected from Islamic Studies, English and Urdu department to judge the speeches. The students were taken very active part in this competition. The cash prizes were given to position holders along with certificates to all participants. This was conducted outside the auditorium. 14 students from different disciplines were participated in the competition. 3 judges were selected from Fine Arts department to judge this competition. The students were taken very active part in this competition. The cash prizes were given to position holders along with certificates to all participants. Purpose: This activity will aid in the development of the non-teaching staff’s capacity and sensitivity towards gender and women issues resulting in positive transformative behavioral change through a gender lens. Raising awareness on Importance of the Gender Sensitization. Developing insights into the issues of various forms of harassment at workplace and its consequences on productivity of organization. 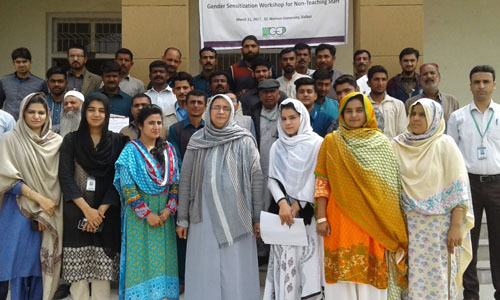 34 non-teaching staff were trained first time in GCWUS about the gender sensitization. Developed an understanding on Gender and work place between men and women. The non-teaching staff were sensitized about the violence. 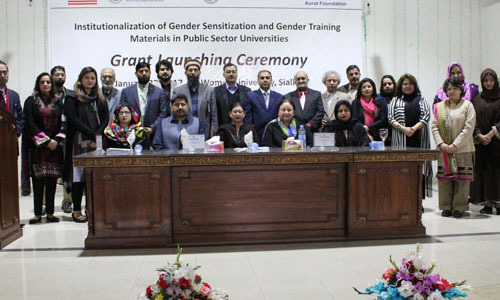 35 non-teaching staff were trained first time in GCWUS about the gender sensitization. 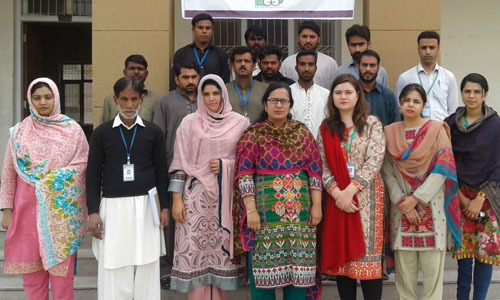 Main Proceedings:This training was conducted by Ms. Raheela Sohail, Assistant Professor, Mathematics Department. The lectures were delivered on the Violence against women and harassment at work place. The following outcomes arises. Purpose:This activity will aid in the development of the non-teaching staff’s capacity and sensitivity towards gender and women issues resulting in positive transformative behavioral change through a gender lens. Main Proceedings:This training was conducted by Ms. Rifat Chaudhary, Lecturer Urdu Department. The lectures were delivered on the Violence against women and harassment at work place. The following outcomes arises. Number of Participants: 100 students participated in different games and cultural event. Students from all departments joined during the activities. Purpose: The purpose of this activity is to encourage female participation and cultural activities arranged showing the cultural differences and heritage. 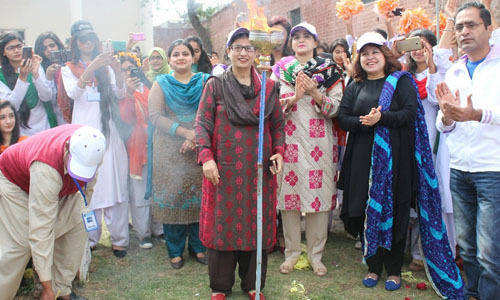 The impact of such activities encourages the participation of females in extra-curricular activities and bring about positive change in the inclusion of all regardless of gender for health and well-being. 12 races / games were organized. 3 cultural events were presented. 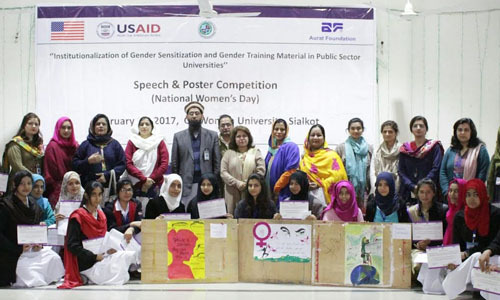 Sports and Cultural Event (in line with UN International Day for Sports and Development of Peace) was held on March 10, 2017 in GC Women University Sialkot. Different types of races i.e. Ralley race, 10 meter, 200 meter, three leg race, juvaleine through, long jump, lemon race, sac race, tug of war (Female faculty), Tug of war (Male faculty and Admin staff), Aerobics/PT show and musical chair game (faculty members). Nominations for cultural show was taken from all the departments of the University. Purpose: The purpose of this activity is to organize 04 participatory interactive seminar/tutorial session for the faculty and students. Other gender related developed documentaries by GEP such as Lal-o-Gohar displayed. Purpose: The purpose of celebrating this Social Work day is to spread knowledge about the social work and motivate other people to do the same. 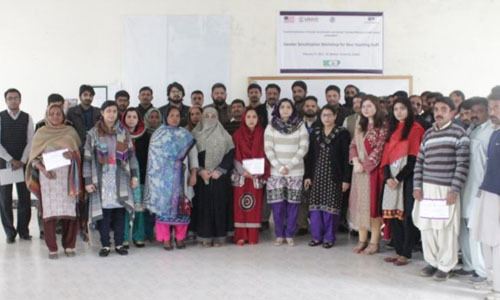 As Gender Equity Program envisions to generate widespread societal demand and commitment for a socially just, democratic, caring and gender responsive society in Pakistan, so this event helped a lot to achieve this goal. Purpose: This event has been organized with the aim to give the participants a platform to show their talent and perform in true spirit. Over 50 students from 4 departments participated.